Heat oven to 350°F (325°F for dark or nonstick pan). Place paper baking cup in each of 24 regular-size muffin cups. In large bowl, beat cupcake ingredients with electric mixer on low speed 30 seconds, then on medium speed 2 minutes, scraping bowl occasionally. Divide batter evenly among muffin cups, filling each about two-thirds full. You can use fresh or bottled Key lime juice. If Key lime juice is not available, use regular fresh or bottled lime juice. 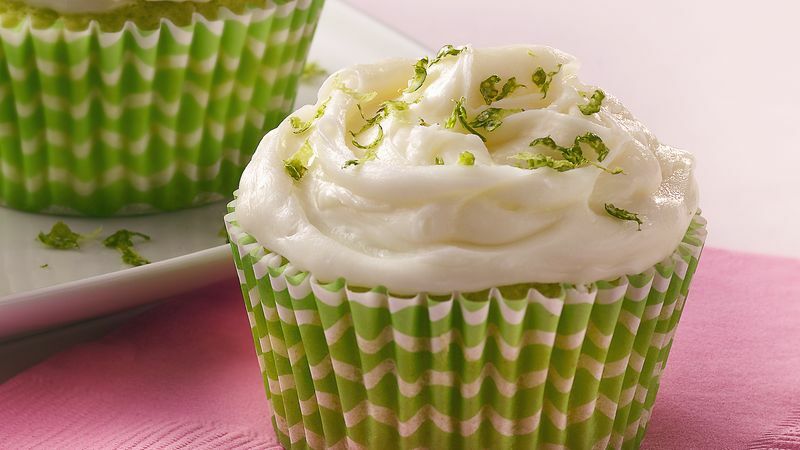 Garnish each cupcake with a small piece of jellied lime candy slice instead of the lime peel.